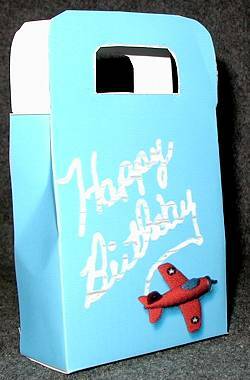 Open the giftbagbday4_mini.pdf file. Use the Adobe program to print out the image. If you have trouble opening the file, be sure that you have the free Adobe Acrobat viewer. You can also save the file to your computer, by clicking on the link with your right mouse button and selecting "save target as" from the menu. After printing, follow the directions to make your gift bag.